The National Health Protection Scheme provides insurance cover for hospitalisation at the secondary and tertiary health care levels. The Union Cabinet recently approved the launch of the National Health Protection Mission which was announced during Budget 2018-19. The Mission aims to provide a cover of five lakh rupees per family per year to about 10.7 crore families belonging to poor and vulnerable population. The insurance coverage is targeted for hospitalisation at the secondary and tertiary health care levels. 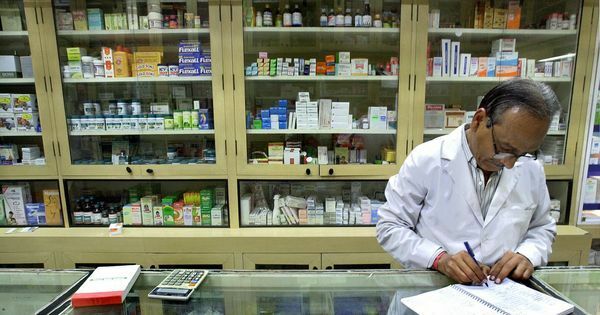 This post explains the healthcare financing scenario in India, which is distributed across the centre, states, and individuals. 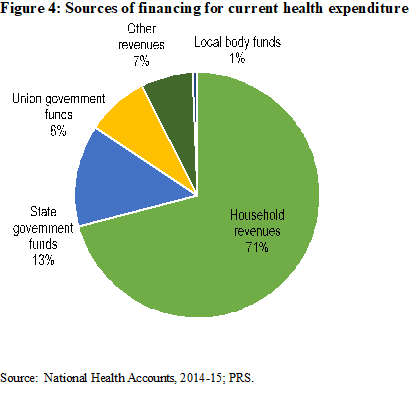 How much does India spend on health care financing vis-à-vis other countries? The public health expenditure in India (total of centre and state governments) has remained constant at approximately 1.3% of the GDP between 2008 and 2015, and increased marginally to 1.4% in 2016-’17. This is less than the world average of 6%. Note that the National Health Policy, 2017 proposes to increase this to 2.5% of GDP by 2025. Including the private sector, the total health expenditure as a percentage of GDP is estimated at 3.9%. Out of the total expenditure, effectively about one-third (30%) is contributed by the public sector. This contribution is low as compared to other developing and developed countries. Examples include Brazil (46%), China (56%), Indonesia (39%), USA (48%), and UK (83%) (see Figure 1). 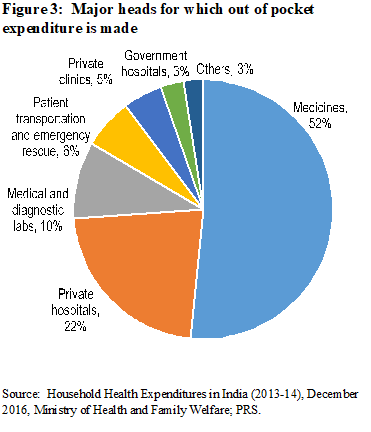 Who pays for healthcare in India? Given the public-private split of health care expenditure, it is quite clear that it is the private expenditure which dominates i.e. the individual consumer who bears the cost of her own healthcare. Let’s look at a further disaggregation of public spending and private spending to understand this. In 2018-19, the Ministry of Health and Family Welfare received an allocation of Rs 54,600 crore (an increase of 2% over 2017-’18). 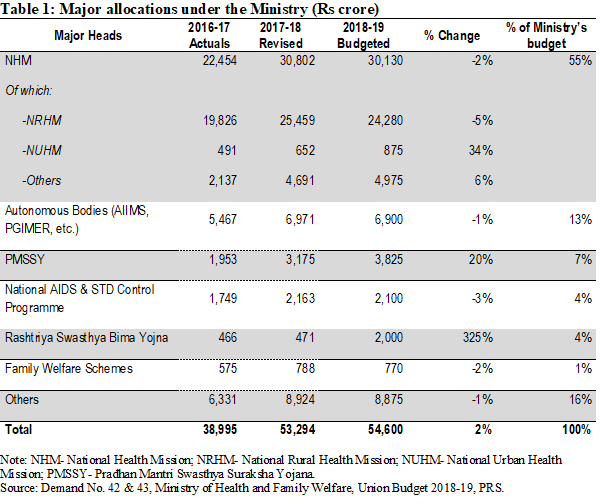 The National Health Mission or NHM received the highest allocation at Rs 30,130 crore and constitutes 55% of the total Ministry allocation (see Table 1). Despite a higher allocation, NHM has seen a decline in the allocation vis-à-vis 2017-’18. Interestingly, in 2017-’18, expenditure on NHM is expected to be Rs 4,000 crore more than what had been estimated earlier. This may indicate a greater capacity to spend than what was earlier allocated. A similar trend is exhibited at the overall Ministry level where the utilisation of the allocated funds has been over 100% in the last three years. A NITI Aayog report (2017) noted that low income states with low revenue capacity spend significant lower on social services like health. Further, differences in the cost of delivering health services have contributed to health disparities among and within states. 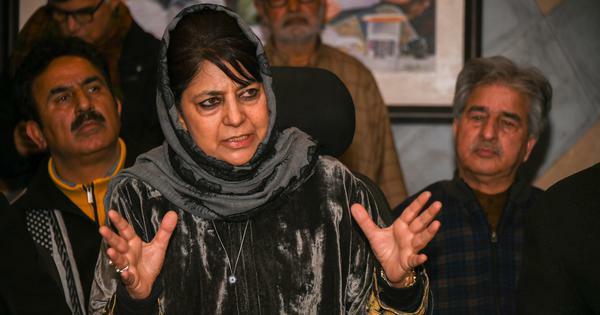 Following the 14th Finance Commission recommendations, there has been an increase in the states’ share in central pool of taxes and they were given greater autonomy and flexibility to spend according to their priorities. Despite the enhanced share of states in central taxes, the increase in health budgets by some states has been marginal (see Figure 2). If cumulatively 30% of the total health expenditure is incurred by the public sector, the rest of the health expenditure, i.e. approximately 70% is borne by consumers. Household health expenditures include out of pocket expenditures (95%) and insurance (5%). Out of pocket expenditure dominate and these are the payments made directly by individuals at the point of services which are not covered under any financial protection scheme. The highest percentage of out of pocket health expenditure (52%) is made towards medicines (see Figure 3). This is followed by private hospitals (22%), medical and diagnostic labs (10%), and patient transportation, and emergency rescue (6%). Out of pocket expenditure is typically financed by household revenues (71%) (see Figure 4). Note that 86% of rural population and 82% of urban population are not covered under any scheme of health expenditure support. Due to high out of pocket healthcare expenditure, about 7% population is pushed below the poverty threshold every year. 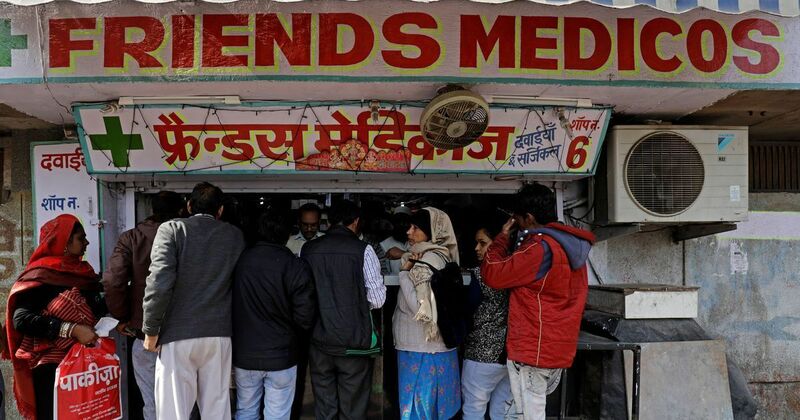 Out of the total number of persons covered under health insurance in India, three-fourths are covered under government sponsored health schemes and the balance one-fourth are covered by private insurers. With respect to the government sponsored health insurance, more claims have been made in comparison to the premiums collected, i.e., the returns to the government have been negative. It is in this context that the newly proposed National Health Protection Mission will be implemented. First, the scheme seeks to provide coverage for hospitalisation at the secondary and tertiary levels of healthcare. The High Level Expert Group set up by the Planning Commission (2011) recommended that the focus of healthcare provision in the country should be towards providing primary health care. It observed that focus on prevention and early management of health problems can reduce the need for complicated specialist care provided at the tertiary level. Note that depending on the level of care required, health institutions in India are broadly classified into three types : primary care (provided at primary health centres), secondary care (provided at district hospitals), and tertiary care institutions (provided at specialised hospitals like AIIMS). Second, the focus of the Mission seems to be on hospitalisation (including pre and post hospitalisation charges). However, most of the out of the pocket expenditure made by consumers is actually on buying medicines (52%) as seen in Figure 3. Further, these purchases are mostly made for patients who do not need hospitalisation. This article first appeared on The PRS blog.